Download our eBook to help you increase your market share, gain competitive advantage and achieve financial success. When you’re a small business owner, you’re always busy, often having to be a ‘Jack-of-all-trades’ to ensure success. Wouldn’t it be great to find an easy and convenient way to improve the way you do business, that leaves you with more time for family and life outside of work? 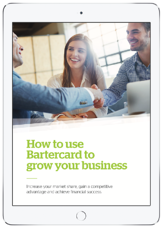 In our eBook “How to use Bartercard to grow your business” we explain how you can increase your market share, gain a competitive advantage and achieve financial success, by incorporating Bartercard into the day-to-day running of your business. Registering for the eBook is easy! Simply fill out the form to the right.